Visit the blog of the ongoing project here. Caroline Claus designed the project L_28 Urban Sound Design. The undeveloped open space along the Western ring railway L28 has long been marginalized in Brussels planning processes. Thanks to its natural, historical and ecological richness the site is an excellent research object, especially in the context of urban sound design. The site in question is the environment of the railway line L28 in the municipalities of Anderlecht and Sint-Jans-Molenbeek with among others Weststation, the subway and tram yard ‘Jacques Brel’, the canal and the regional green network as prioritary projects of the urban development in the coming years. 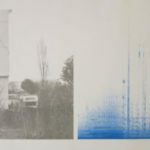 Four workshops explore the relation between the sonic environment and the landscape of the area. By means of soundscape research based on theoretical insights by Murray Schafer, CRESSON, Steve Goodman or Detroit Techno and the method of acoustic ecology, an overview of different components shaping the existent soundscape of the L28 is given. Through listening experiences accompanied by reflections via site-specific performances, a sound map and city sound walk, we analyze the very nature of the area. In a dialogue with experts from fields such as field recording, acoustic ecology and urban planning we reflect on how the current sound environment could be improved in a participatory manner. Introduction of the actual planning context of the site with a focus on the history of one of the symbols of its economic development, railway line L28 and the actual relation between inhabitants and their environment. Presentation of the politics of the region regarding the control of sound pollution and vibration in the Brussels Region. The urban dimension of electronic and dance music culture. The sonic geography of the site and the relation between the sonic environment and the urban space. Application of interactive technology and social media for alternative cartography of sound in the city.